Come journey, explore, discover and interact with Canada from coast to coast to coast on the new and improved Canadian Trail at Canada Place! 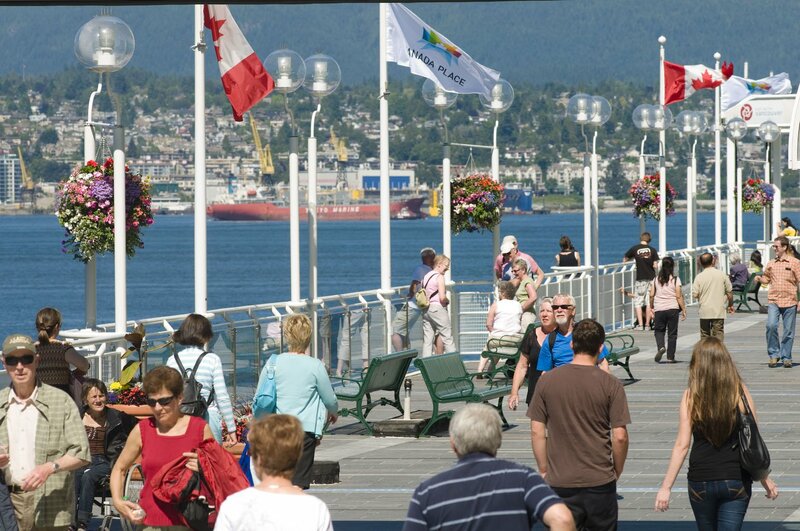 Along Canada Place’s west promenade, The Canadian Trail is a unique walk across Canada from east to west and north to south. The Canadian Trail is divided into 13 equal sections to represent our 10 provinces and three territories, and each province and its communities are indicated in tile and coloured glass. Do you know in which province Joe Batt’s Arm is located? Can you find Old Crow along the trail? As you proceed on your “cross-Canada trek,” search out your familial roots or marvel at some of Canada’s more uniquely named cities. Stroll along The Canadian Trail to the North Point for incredible views of the Port of Vancouver, Stanley Park, Coal Harbour, Burrad Inlet and the beautiful North Shore mountains.